I am working on a custom plugin that import posts from external website. I use following code to create a post in QA platform with data retrieved from external website. I get $title, $content, and $tags successfully from external website using simple HTML DOM parser. And I use strip_tags() function to remove html tags and keep only text. Actually, in $title there are also some characters such as (ý), but it appears normal, not as &yacute;. It happens only in content of question. When I just retrieve the data and print it with echo() or print_r() functions the text appear normal without any irregular symbols. These symbols appear only when I use qa_post_create() function to create question. Also, when I change format from '' to 'html' in qa_post_create() function, it resolves. But I do not want to use format='html'. Is there any other way to fix it? 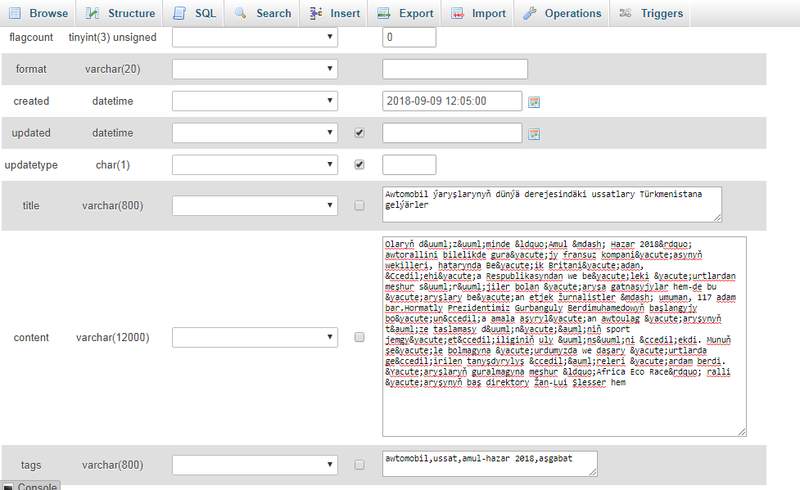 Everything would be clearer if you query the database and show exactly what you're storing. You are saying that what you see in the browser is X and you're assuming you're storing X while, in practice, it doesn't really have to be that way. For example a bold text is actually stored in the database as <strong>text</strong>. Just run it for the fields that are HTML encoded before inserting them in the database. Yes DOM gets html content, however, I use strip_tags() function to remove html tags. But the above problem occurs. I have not tried html decode function, let me try if it works. @pupi1985 many thanks html_​entity_​decode() function fixed my issue.